Another Evening WASTED Sitting At My Computer! "Hey Geek! You spend all day in front of a computer. You're a Systems Analyst, you write programs eight hours a day. Don't you have something better to do when you get home?" Actually, nobody has ever asked me this. But if anyone ever noticed that this is how I spend my evenings, five nights a week, they might wonder. The thing is, you can do a lot of 'stuff' with a computer. There's games like Minesweeper, etc. for those times when you're just bummered out and want some totally mindless thing to do and you don't feel like reading. But you can do some social things, too. Also, since I don't have television and my radio-listening hours are limited by the requirements of working for a living, and I refuse to pay those leftist-pinkos who write for the newspapers in Red-State Oregon, I can check out the news at a world-wide selection of news websites. In fact, if I'm curious about politically slanted interpretations of the breaking news, there are a number of commentators who are woodified in hopes that I'll check their website to find out what THEY think. (They're entertaining ... especially Anne Coulter ... but they don't form my opinion. Rather, I look to see if THEY know anything I don't know; more often, I check to see if have achieved the zen-state of understanding which compares favorably with my own "God-like" talent to interpret the news. Or, you can look up the cinematic contributions of Forrest Tucker, which is one of the oddball things I did to support my Geeky READING post yesterday ... believe it or not. April First. Tonite, I pay my bills. Mostly, I make payments online. AOL is an automatic deduction, as are car insurance, life insurance, and renter's insurance. Credit card ... paid it. Electricity ... not due yet. I'll pay it next week. Land-line phone ... paid it. Cell Phone ... not due yet. I'll pay it next week. All of these bills are paid online. I also checked my bank account to ensure that my paycheck had been credited. Car payment ... not an issue any more, Brother. Paid it off early ... online. Rent ... wrote a check. I'll put it in the landlord's mailbox in the morning. It's easy to forget this, but I just write the check when I pay my other bills. Some of the websites load slowly, there's enough time to write a check and stuff it in an envelope. Water and Garbage: included in the rent. Oh, the joys of non-home-ownership! Gun Club Membership ... wrote the check and put it in the mail. There are a couple of new things this month, tho. Income Taxes ... paid it, online, for a $5 fee. My bank has a deal with TurboTax which accepts online tax filing requests from bank customers at a reduced rate. Unfortunately, I could only file my Federal taxes with TurboTax. When they calculated my State Taxes, they decided I owed the state of Oregon another $1680. By my calculations, I owed $106. I wrote TurboTax a curt note on their "feedback" website, indicating most graciously that I couldn't afford their services in this area because it would require that I overpay by 1500%. I'll do my state tax return tomorrow, on paper, and still grumble about the absurd socialist tax structure in Oregon. At least I don't have to pay Property Taxes anymore, since I'm renting. Oh sure, I DO pay Property Taxes, because it's part of the way my rent was calculated. But I've lived in the same place for 9 years now, and my rent hasn't gone up one penny. Tell me, you folks who own your own home ... habe your property tax, maintenance fees, garbage service and water/sewage bills stayed the same for the last 9 years? And when your diswasher breaks, do you have to buy a new one? Or does some kind neighbor (in my case, the owner) replace it for free? That's what I though. Oh, the joys of non-home-ownership! Next, my car registration is due to be renewed. Paid it ... online ... in the comfort of my home and on a secure website. Computers are better than hanging around the DMV waiting for your number to be called. Did you know you can't smoke in a public building in Oregon? Screw them. I smoked a cigarette while I renewed my car registration. Life is good when you're a Geek. Finally, I received an email telling me that a bill has been introduced simultaneously in both the House and the Senate (by Senate Majority Leader Bill Frist and Senator Lamar alexander, both of Tennessee), intended to help the Boy Scouts of America (BSA) with their fund-drive problems. You are probably aware that, thanks to the American Civil Liberties Union, the United Way fund-drives no longer support the BSA in fund-raising activities. Further, the ACLU has taken direct action to insure that the BSA can no longer hold meetings or conduct recruitment campaigns on school grounds. The have lost access to many of the public venues where they once held "Jamborees" and meetings. This bill will, hopefully, return their right to use these public facilites. The “Support Our Scouts Act of 2005” guarantees the Boy Scouts’ right to equal access in a number of ways. The legislation removes any doubt that Federal agencies may welcome Scouts to hold meetings and go camping on federal property. It ensures the Defense Department can continue providing support consistent with U.S. law. The legislation also ensures state or local government entities do not deny Boy Scouts equal access to public facilities, programs, or forums. Finally, the act clarifies that federal agencies cannot provide less support to the Scouts than the agency has in the past. I told them that back in the '50s and the '60s, when I was growing up, it was EASY to be a kid. My parents were married. We had scouting, where we could go places and do things with other kids, and we didn't have to wonder if whether the scout-master was there to help us or to do bad things to us. We knew we could trust them. I told them that kids today don't have it so good. Their parents are making babies, then going their separate ways. Children aren't 'given' good role models, they have to take 'em where they find 'em. I said that the BSA is finding pedofiles in their upper ranks even when they try real hard to weed 'em out. The Catholic Church in Portland, Oregon, has declared bankruptcy because of the civil suits they had to pay out due to the predations of pedophiliac priests ... PRIESTS! For Christ's sake, can't we do better than that with the Boy Scouts of America? These people are trying to hold the line, to protect our children and teach them the values of common decency, but there are people out there who want to put our children at risk for the sake of chimera .. a freaking PHILOSOPHIC CONCEPT ... called "diversity". And I said that there wasnt' a damned thing I could do about it. I'm nothing but a balding, over-aged misanthropic Geek, and all I can do is write letters to people. But this bill could help the Boy Scouts at least regain some access to facililties which were available to them before the 'diversity' thing got blown out of proportion, and I think it's worth the effort to support it. Maybe they could do something to help a worthwhile cause. Of course, I didn't put it quite that way, but that was the general gist of my comments. So there it is. How I Wasted My April Fools Night, Sitting In Front Of A Darned Ol' Computer. How did you spend YOUR evening? Here's a first: instead of talking about IPSC, RKBA, current events, cultural issues or any of The Usual Subjects, I want to talk about books. If it can be said that I am 'into' IPSC, then it must be also said that I am WAY into books. At any time, I have at least three books 'going'. And I don't have any problems with keeping the story-line or theme separate. Where books are concerned, I'm not only vociferous, I'm omnivorous. I choose 'themes', or 'authors', and I read a slew of books in this category until I burn out. I have (as far as I know), and re-read frequently, every book that Robert Heinlein ever wrote. I'm currently working my way through a 10-volume set of the works of Rudyard Kipling (printed 1923), and earlier this month I bought two more volumes of Kipling because I learned that he had written a lot of his best work after that publication date. Science Fiction has been my first love, since I discovered an omnibus of the works of Lewis Padget's (the pen name Henry Kuttnerand his wife Connie "C.L. Moore") in the Pendleton, Oregon, Umatilla Ccounty library about 1960. I had previously read Phillip Wylie's "Generation of Vipers" and "Tomorrow" and "The Disappearance" and "Gladiator" (a progenitor tale of the 'Superman' myth), and found them fascinating although I didn't realize that what I was reading was social commentary often disguised as Science Fiction; but when I read Padget I was hooked forever. Ringo has written about a dozen books by now, mostly in a couple of series. The best of them is the "Marching ..." series (Marching Upland, Marching Upland, Marching to the Stars) and the final book is "We Few", the subject of this post. You're probably waiting for the punch line by now. Expecting there to be a "point" to this. Well, the point is that I enjoy this author so much that I ordered his latest book (We Few) in September of last year, expecting it to be published on schedule in November. It didn't happen. In fact, this book has been republished for an April, 2005, release date, but Amazon.com received a shipment and filled my order early enough that I finally received it today. So I'm going to close my little "I Like To Read" post, finish cooking dinner, and curl up with my latest literary acqusition. It'll probably mean I'll read through the night, get to work late tomorrow morning, and not be worth a damn because I'll only have had a couple of hours sleep. Or maybe I'll only read a couple of hours, turn the lights out, and get a good night's sleep. Last Saturday we went to an IPSC Club Match on the rainiest March 26th in Fifty Years. No, this picture isn't from that match. The sky is too clear, and the targets are un-bagged . . . and in better shape. But it serves to illustrate how necessary it is to take special precautions during 'inclement weather'. You'll notice that most of the target stands have sandbags holding the legs down; this is so the wind doesn't blow them over. Also, the cardboard targets have been warped by the moisture they have absorbed. This is hardly an extreme condition; we saw what 'extreme conditions' can do to cardboard targets last weekend. This is nothing new to those of us who compete in IPSC matches in Oregon year 'round. When the air is excessively humid (as during a constant drizzle, which we experienced Saturday), the cardboard absorbs the moisture and curl, as you see here. 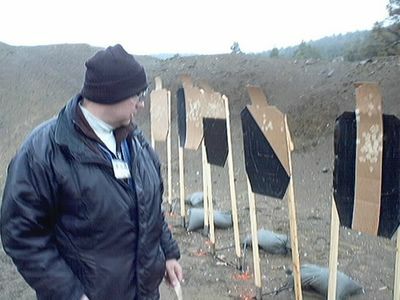 More important, when the rain is allowed to fall on the targets, they become so saturated that it is difficult to keep the tape, which covers the bullet-holes caused by previous shooters, to stick to the surface. And taping the bullet holes becomes particularly difficult, as the person doing the taping needs to lift the bag to reach the holes, then carefully smooth the plastic down over the target. Sometimes an impatient taper will cut or tear a slit in the bag, to facilitate access to the surface; this slit can be opened by the wind allowing rain to soak the target. In this particular match, the Match Director had made careful plans to avoid as much as possible the conditions which would slow down the match, or make it difficult to accurately score the targets. However, the weather was so windy and rainy that the advanced planning sometimes proved less than completely adequate. First, not all targets were fixed firmly to the ground. During the walkthrough, we found that all of the targets on one stage had been blown down by the wind ... all of the targets had to be replaced before the match even started. During the match, we discovered that the stage construction crew, in their drive to prevent the bags from blowing off the targets, had placed the bags over the targets before stapling the targets to the supporting wood sticks. This met their goal, but it made it very difficult to tape. In frustration, some squad members applied their own Gordian solution by tearing the bags covering the front of the targets. This allowed them to easily tape the bullet holes, but the rain quickly soaked the targets ... and it wasn't an unusual occurance for bullets striking the wet targets to blow tape off previous bullet holes, making it difficult (or impossible) to determine which hole had been made by the current shooter. We were thankful that extra replacement targets and were available on the stages, but the frequent need to replace targets soon exhausted the supply. By the last half of the match, everyone seemed to be so tired that few squads made the extra effort to find a member of the hosting club to find out where new targets could be found. The last couple of stages were sometimes very difficult for Range Officers, tapers and competitors. There was two other situations which slowed down the match. First, the classifer which had been scheduled for this match was CM99-14, "Hoser Heaven". In this stage, there are three strings ... and the targets must be scored and taped before each string. In retrospect, the need to disrupt the stage twice for each shooter greatly increased the stage-clearance time, and delayed the match significantly. Second, because of the weather some out-of-state competitors didn't arrive at the range until after the match had started. They joined the squad which started on the stage just before the classifier stage, changing the size of the squad from 11 (which was the approximate size of the other four squads) to 17. Apparently, this was their own arbitrary decision; the Match Director wasn't informed until that squad was half-way through the classifier. One person left early in the match, the rest split up into two squads . . . but not before the back-up on the classifier stage had become impossible to resolve. I realize that this this litany of events may seem critical of the pre-match choices of the host club, but in retrospect there were few decisions which didn't seem reasonable at the time. The INTENT was to have all targets bagged, staked, and replacement targets allotted on all stages. Unfortunately, the weather was so inclement that the events strained all prior planning. The extenuating circumstances are that Oregon had, for the previous two weeks, experienced an unseasonably warm and dry situation which looked more like early summer than late winter / early spring. We had become complacent, not least because the media had been predicting the worst draught in 60 years because so little rain & snow had fallen over the winter. (1) During seasons which are typically inclement, plan for the worse, marshall your reserves . . . then double it! (2) It might have been a good idea to have a "Mr. Fixit" roaming the range during the entire match, to spot potential trouble-spots before they became critical. This last measure, while prodigious of limited personnel, may have resolved many unforseen situations which eventually delayed the match. In an all-volunteer sport, it's difficult to forsee the worst possible scenario and provide the staffing needed to counter it. However, if the goal is to provide a safe, enjoyable match to the participants, it may be necessary for the host club to schedule some non-competing personnel to insure the goal is met.